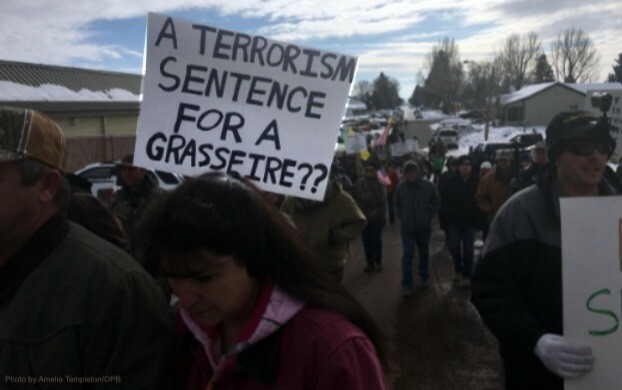 Many of the 300 Burns, Oregon residents (pictured above, 2 Jan 2016) – marching in peaceful protest of mandatory prison sentences for local ranchers – came to feel betrayed. Both by re-sentencing and, in a pre-planned action, when armed members from rump militias split from the group, to militantly occupy a Federal wildlife refuge. But all organizers ought to perk up when leaders, invited to address a community meeting set up by local residents, are ambushed in a military-style operation. Those in #BlackLivesMatter, who now face military-grade tear gas, know escalation in pain-giving has become public policy. 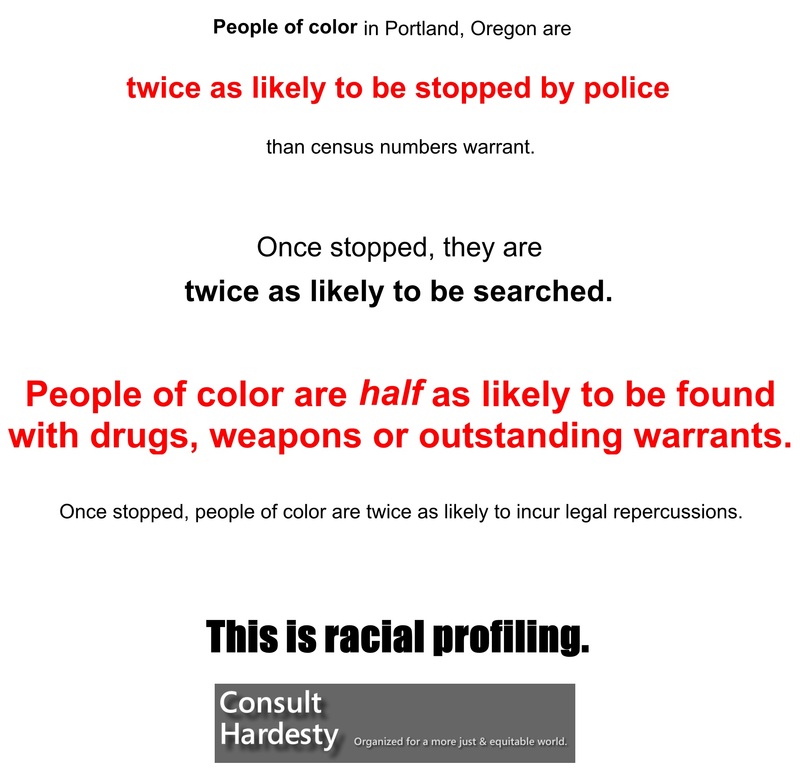 Our consultancy knows it sits in Oregon law enforcement’s surveillance cross-hairs. I’ll admit, it is quite difficult to separate the agenda of the group, which later styled itself as ‘Citizens for Constitutional Freedom,’ from their tactics. It’s also difficult to get ‘progressives’ to assess 1960s-era tactics against desired outcomes. 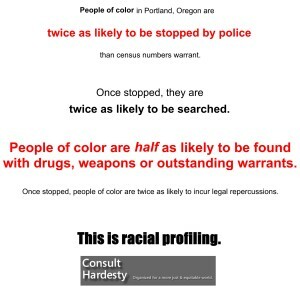 After long-term public agitation that proceeded to state level, the City of Portland, Oregon was ordered in 2000 to begin collecting evidence of racial bias in police stops. The numbers have not changed; disclosure remains three years behind police collection and analysis of their data: it’s as if our perpetually White City Council is using periodic reports to simply affirm racism as our standard. It may be time to revisit engagement strategies. I’ve been researching mid-19th century America, prior to outright civil war. Increasing militancy did lead to substantial, societal change … in abolition of slavery. I observe modern-day strategy has generally failed to take precursor steps which social change agents once routinely relied on. We have to hand, in American heritage, an established means to air grievances and gain relief from unjust governance. I offer you the model of conventions. Convenings were self-initiated among enfranchised people who held aspirations. Ideas for group structure and campaign mission were obviously circulating, but – in assembly – those in attendance elected their own leadership and delegated tasks through parliamentary procedure. Resolutions were drawn up and voted out. Petitions conveyed the social status and number of signatories to office holders. 18th century revolutionaries assigned Committees of Safety and of Correspondence: they set up contingency plans, should their grievances not be resolved; they cemented relationships in as broad of a community as they could form. Missourians convened themselves in 1854. They elected a Minister Plenipotentiary who was dispatched to negotiate preliminary treaty provisions among the Otoe and Missouria nations. Provisional (non-voting) delegates were elected to the U.S. Congress in both Iowa/Missouri and Indian Country conventions: they actually sat in on House and Senate subcommittees, and informed policy debate. Congress had been politically deadlocked on territorial expansion for nearly a generation. Within six months, and in an era before telegraph communications, Kansas and Nebraska Territories were opened for settlement. Social media has done much to allow like-minded activists to build affinity. Organizers will forever struggle with passivism and the challenges of bringing the passionate into direct, results-oriented action. We have elsewhere encouraged a new generation of racial justice advocates to re-think engagement strategies, and assess old-guard, chanting marches against the actual changes these tactics have brought about in their own lifetimes. Perhaps there are technological innovations to be applied, but it may be time to study the one-two punch of self-initiating convenings, and self-organizing militias. Militia training occurred at ‘musters.’ Head counts were taken, rudimentary training carried out. Most accounts that have risen to my attention present them as wild, boisterous, hard-drinking affairs, but undoubtedly they created space for political dialogue, consensus-building, and firming of resolve. Militia members looked into a local talent pool and elected their own officers. Imagine if the last decade of community input, from the Oregon ACLU; Portland chapters of the League of Women Voters, National Lawyers Guild and mental health associations; the Albina Ministerial Alliance Coalition for Justice and Police Reform and Portland Copwatch were distilled and resolved upon in broad community. Imagine a packaged proposal whereby civilian review of police conduct (investigation via power of subpoena, authority to instill discipline) were presented in petition form, for inclusion in the City Charter. A convention could accommodate such … but the Action Plan might become more than another round of pleading for reform. I’m of the belief that Malcom X’s militancy made Dr. King’s approach appear viable. Imagine as background – to citizen demands that equal treatment under the law obtain structured oversight in the city’s constitution – that community groups trained themselves for militant, direct action. The earnestness with which political leaders would take up racial justice demands might become speedy. Many in the peace movement would label such response ‘wild.’ They’d likely adopt media portrayal and immediately jettison militiapersons to the fringes. Social approval for communities of color to organize their own, community-based policing units is low: it is a response far too bold, and difficult to appreciate for those not routinely rousted (if not beaten). 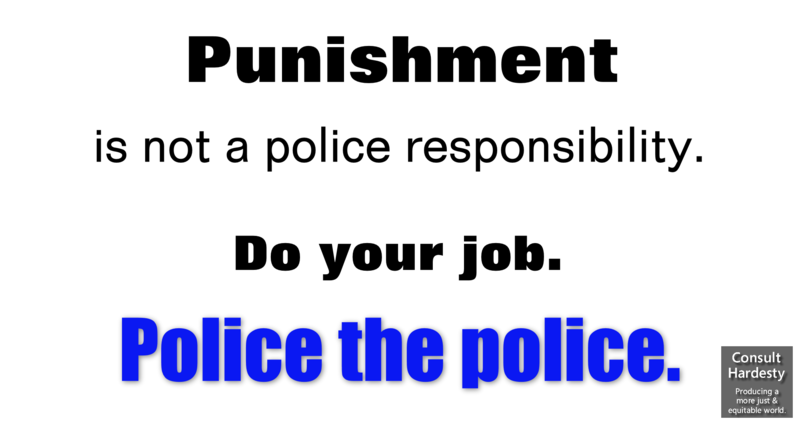 Freddie Gray’s homicide (Portland has its own examples) teaches us police intervention predicated on simply running away … in advance of pistol grip-cattle prods or beating, or unjust confinement … is one pathway to death in custody. As if self-preservation by flight is somehow evidence of criminal conduct. These folks need refuge from injustice. Please do not confuse militia organization with criminality. Equate it with a stiffening of resolve, and an indicator that due diligence need be given to demands for protection from real harm. A growing body of justice advocates pierce complexity to appreciate DoJ reforms are superficial, police-centric, and skirt away from racism entirely. Front-line activists experience violence-inducing escalation in police munitions and engagement strategies. Almost anybody can tell a base of nationwide support for reform is building. Aspirations are rising. At some point the willingness to take pain on one’s own terms may tip a balance away from that which armchair pacifists prefer. Many have given superficial analysis to media portrayals of what has gone on in Harney County, Oregon. When reading this litany of prior attempts at redress, I could not help but feel the Hammonds’ frustration in working for generations within the system. We know that justice advocates are likewise kept from influencing meaningful transition from Oregon’s racist history. Forever at an imbalance of resources, we know our adversaries retreat from transparency to emerge with legislative complexity and fake accountability systems which merely simulate justice delivery. I contend Citizens for Constitutional Freedom have given police accountability activists some elbow room. Political will, to defend police self-exoneration schemes, is at low ebb. Merely preparing for militant action – in an organized way – may perhaps be sufficient to prompt weather vane politicians … to finally adhere to countless recommendations they’ve let lie on the shelf. Citizen self-initiative can overcome caretaker governance. This is a pretty awesome article. Declaration of Dissolution on page 30. Note: ‘passivism’ relates to not participating readily or actively. ‘Pacifism’ is a belief system, anchored in non-violence and often confined to the conviction that it is wrong to use war or violence to settle disputes; it offers features of non-resistance. The Hammond brothers,whether they were drunk or sober, started a fire while talking about setting the entire Country on fire. It was a KKK style, illegal fire. It was terrorism. UPDATE: Police lied. The U.S. Department of Justice Office of Inspector General is investigating the actions of the FBI’s Hostage ‘Rescue’ Team in connection with the above ambush. Five unnamed Federal agents lied about FBI shooters and are under criminal investigation by Inspector General Michael Horowitz. It’s Kafkaesque that news reports of the investigation contain the premise, “Police Justified” … as if we shouldn’t let investigation results hamper an intended outcome. The Hammond father and son – whose Federal sentencing the Burns community initially protested – have been released by an extra-judicial act. Los Angeles Times reports the back-room chicanery. Greg Walden, Oregon’s lone Republican congressman, called for Trump to pardon the arsonists in a House speech. Meanwhile, an oil man’s prior $50k payment to US VP Pence greased the skids for release. Pearce also reports the lubricator’s ownership of the NFL Colts; exposes him to consumer backlash. 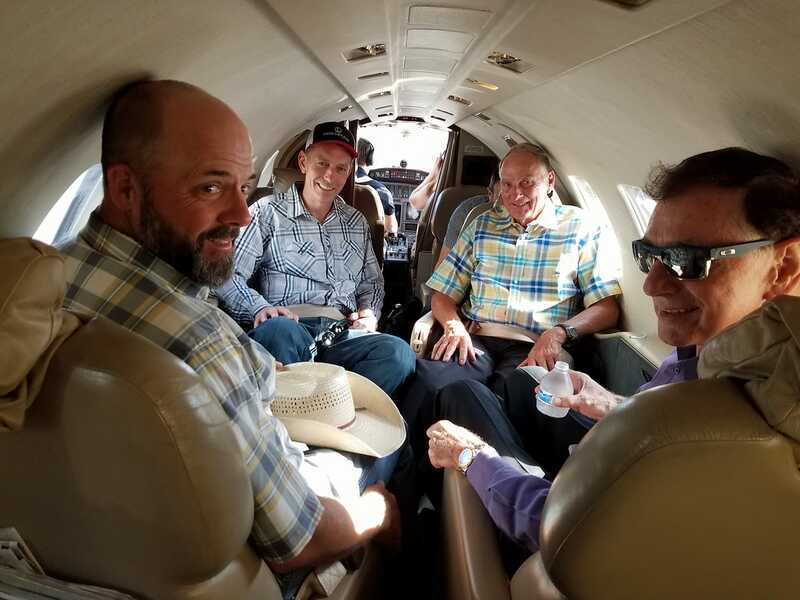 Story here: Pardoned by Trump, Oregon ranchers ride home in style on Pence ally’s private jet.